I love doughnuts. I associate them with vacation - a traditional pick up en route to the airport. I had not looked up doughnuts in advance, but had the good fortune to see a giant doughnut sign while riding the historic monorail that was built for the 1962 Seattle World's Fair. You don't look a gift doughnut sign in the mouth. 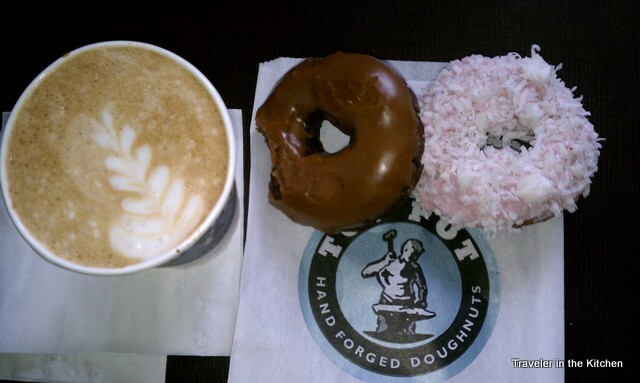 Only now, after visiting the Top Pot Doughnut site, do I know that I had the good fortune to visit their flagship cafe! (That's the one on 5th and Blanchard). It has a library/coffeeshop feel, and I definitely enjoyed my pink feathered boa, chocolate maple, and latte complete with art. By sheer monorail luck, I have now tried the Best Doughnut in Western Washington. When was the last time you discovered something delicious by accident?